Creating dungeons and maps for role-playing game sessions can be exhausting. There’s so much to consider! Aesthetics, settings, balance, excitement, authenticity, it’s a minefield of creativity and potential devastation. Writing up campaigns and encounters isn’t something I struggle with. However, putting maps together for these things is something I find to be particularly time-consuming. Thankfully, I’ve acquired something to help me out with this. Enter, the Big Book of Battle Mats! 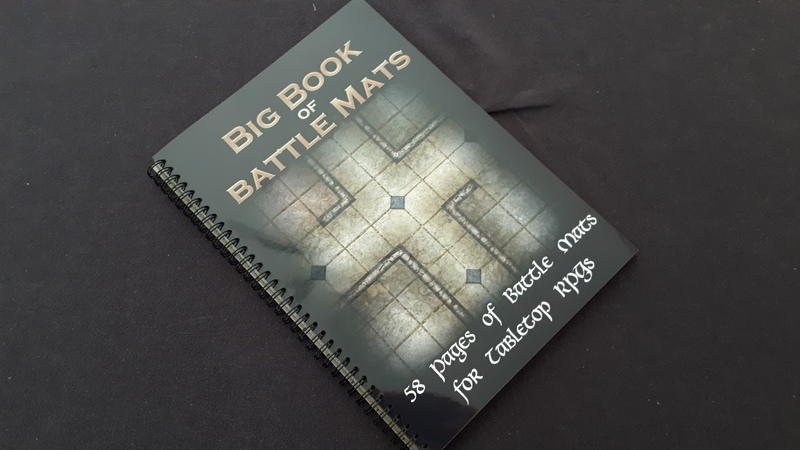 Available from Gaming Books, the Big Book of Battle Mats is designed to be a quick, one-stop shop for fantasy RPG battle mats. It’s A4 sized and packed with pages plastered from side-to-side with environmental artwork. Each page is covered with a 1″ square grid all over to accommodate most gaming systems and miniatures. Each design can be used as a single A4 page or a spread across both open pages. When you consider the idea on paper, it sounds pretty optimal. It’s easy enough to carry around with your other RPG books and the quality of the print on the pages is certainly good enough. Providing you use erasable markers, you’re going to be having a good time. There’s good variety too in terms of settings. It includes throne room, a countryside plan with a river and bridge, a lava cave and numerous more. At the back there’s even a blank set of pages with just the grid on for when you need something more bespoke. I confess, the biggest drawback I have with the Big Book of Battle Mats is that it’s not quite big enough! An A3 size would be preferable for me along with some sci-fi settings, too. It seems that this feedback isn’t isolated either, or we’d not be seeing this funded Kickstarter. It appears that Gaming Books are looking to release a larger book whilst also containing sci-fi environments. This ticks the two boxes that left me wanting more. If anything, I wish I’d waited! However, I’m going to try to fully emphasise one of the key selling points of this product; for me, at least. No longer do you have to call off a session because you haven’t had time to build a map or dungeon. No longer do you have to rely relentlessly on bringing a large roll-out map and a flurry of pens. You barely need to flex those creative muscles at all (though, of course, you probably should). This handy, not-so-little book means your RPG sessions not just easier but more accessible for those last-minute gatherings! One of the issues with tabletop games is that it can take quite a lot of prep work. The Big Book of Battle Mats helps to make this element just that bit less stressful. I’m going to be giving it a spin over some upcoming sessions I’m going to be partaking in. I’ll be sure to let you guys know just how well the book works out. Who knows? Maybe I’ll soon have to acquire the upcoming A3 version if it proves as useful as I’m hoping. It might even help bring a little more convenience to some of my Star Wars adventures! For more on all your tabletop and role-playing game needs, be sure to pop by our Facebook page!